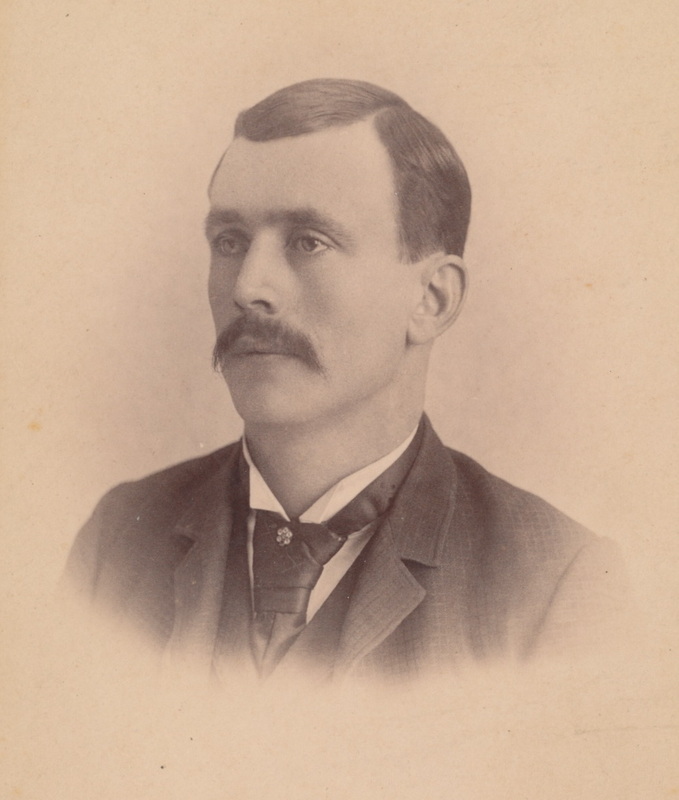 Frederick Peter Spinner was born September 14, 1866 in Village Creek, Iowa in Allamakee County. He was the son of Peter Spinner and Katharina (Markt) Spinner who were both natives of Germany. Frederick was one of eight children and his siblings include Carl Anthony, Francis Joseph, Mary Catherine, Katherine Mary, Peter Jacob, William Joseph, and Constantine. Frederick received his education in the rural schools of the Village Creek community. On October 25, 1893, Frederick at the age of 27 married Miss Florence Barnes, daughter of Dr. and Mrs. Barnes of Waukon, Iowa. The wedding was held at St. Pius Catholic Church, Cherry Mound, Iowa. They made their first home in Waterville and later moved to Lansing. They were the parents of ten children- a son Joseph (who died at the age of three), and daughters Hazel Erickson, Miriam Jones, Mildred Morgan, Florence Cassidy and sons Fred, Leslie, Clarence, Mark and Thomas. Frederick was engaged in the blacksmith trade which he learned from working with his father Peter. In 1895Fred went into a business partnership with his brother Frank. They started a blacksmith, wagon and repair shop eventually adding the sale of farm implement equipment, wagons, buggies and later automobiles when it became a Chevrolet dealership. 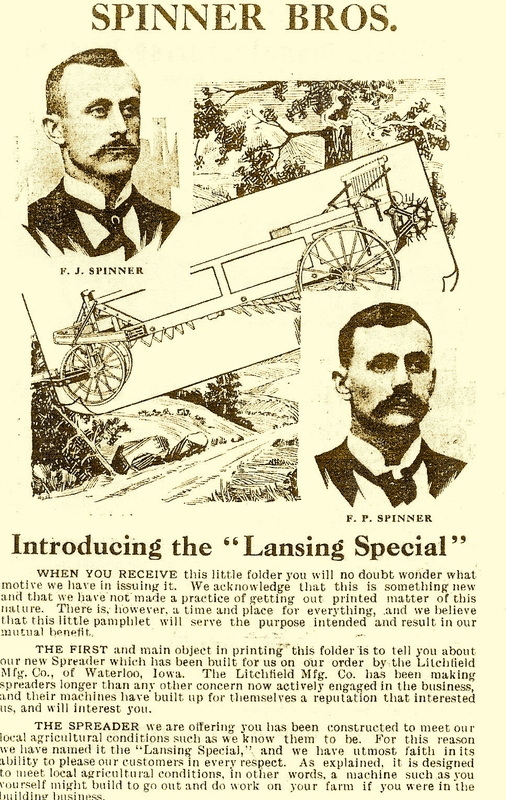 The Spinner Brothers business, which was located on Main Street in Lansing, was very successful. The Spinner Brothers also had a branch in Harpers Ferry. They were in business together for 41 years. Frederick retired in the late 1930s when his health began to fail him. He was known as a very industrious hard working man of genial disposition and hospitable manner and a great friend of the young folks. “Boomer”, as he was popularly called, made a wide acquaintance during his long period in business. Frederick passed away on Sunday morning, November 26, 1944 at Abbott Hospital in Minneapolis, Minnesota at the age of 78. He had been suffering with hardening of the arteries for a very lengthy time. His wife Florence continued to live in Minneapolis with her daughter Hazel Erickson until her death in November 1956. Both Frederick and Florence are buried in Gethsemane Cemetery in Lansing, Iowa. Fred and Ed Spinner, Florence at age 16, Fred and Florence, Golden Wedding Anniversary photos. Four of their ten children: Leslie, Hazel, Miriam and Mildred.